August 2018 – The BPA2035 Quick Connect/ Disconnect allows for fast connections and disconnections of fixtures and end effectors. 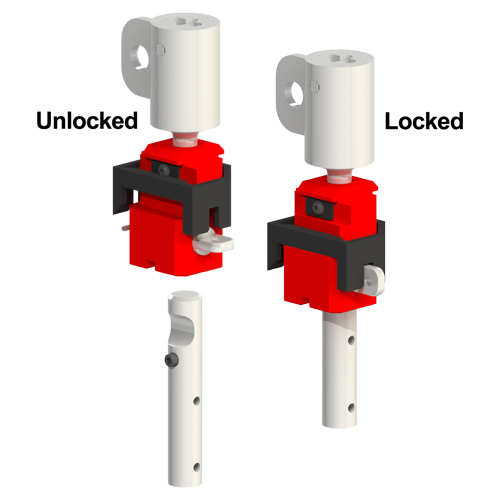 The Quick Connect/ Disconnect easily disengages by the simple push and twist of the release pin. For more information click here. January 2018 – The safest and most intelligent hoist in the world. It is designed to prevent a hoisted load from dropping. This new revelation will change the entire hoist industry with Knight Global in the forefront. For more information click here. Designed to be more robust, this end truck provides the added benefit of a 4 bolt connection to the bridge and welding for stability. Its dual pivoting allows for limited skewing of the bridge while still maintaining the same freedom of movement as Knight’s standard End Truck. For more information click here. January 2018 – With the new design, dual I-Beam clamps are used, allowing for loads to be centered on the clamp, providing more stability and less wear on the hanger overall. For more information click here.